YouTube's myriad cat videos are coming to a subscription-free television near you as YouTube is set to launch on Freesat. Rather than an actual YouTube TV channel, as was first thought by the Telegraph, it looks as though the free-to-air satellite TV service will be offering an app of sorts, accessible from the Freesat EPG. 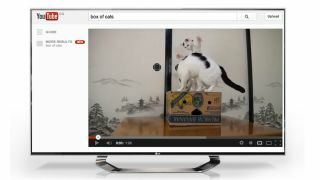 The deal that Freesat has signed with Google should see the dedicated YouTube area launching by the end of March 2013. Built on HTML5, Freesat's YouTube will be optimised for television, promising a "visually stunning" and "fully interactive" experience. Freesat's MD Emma Scott promises that Freesat viewers will get "an exclusive first view" of the latest version of YouTube, something that was "previously unseen on free to air TV in the UK". It's not clear yet how much control you'll have over what is shown on the 'channel' - whether you'll be able to access any video you like for an any-time big screen Gangnam fix or if the channel will be curated with top YouTube picks. We're waiting for more details on the logistics from Freesat so we'll keep you posted on that. One thing's for sure, the new service won't set Freesat customers back any extra money. To get Freesat, you'll need to have a satellite installed and a Freesat set top box but there are no monthly subscription fees a la Sky.